Thanks to Dr. Jessica Kozel, University of Missiouri and Dr. Leon Barnes, University of Pittsburgh, for contributing this case and the discussion. To contribute a Case of the Week, follow the guidelines on our Case of the Week page. (3) Click here to subscribe to our next Promotions email, to be sent before the CAP conference in September 2011. It lists special offers from our advertisers, and we give away two $25 Amazon.com gift cards just for subscribing. Click here to view our last Promotions email. A 44 year old man had a parotid gland mass, which was excised. Low grade cribriform cystadenocarcinoma (LGCCC) is a rare salivary gland tumor with a striking resemblance to atypical ductal hyperplasia and ductal carcinoma in-situ of the breast, and an excellent prognosis (Cancer 1996;78:958, Am J Surg Pathol 2004;28:1040). It also been called low-grade salivary duct carcinoma, but this designation was abandoned in the WHO classification to avoid confusion with salivary duct carcinoma, which has a very poor prognosis. However, some authors believe there may be overlap because there are reported cases with adjacent high grade salivary duct carcinoma. This tumor is now listed as a variant of cystadenocarcinoma. There is a female predominance and most patients are elderly. All but one reported case have occurred in the parotid gland. 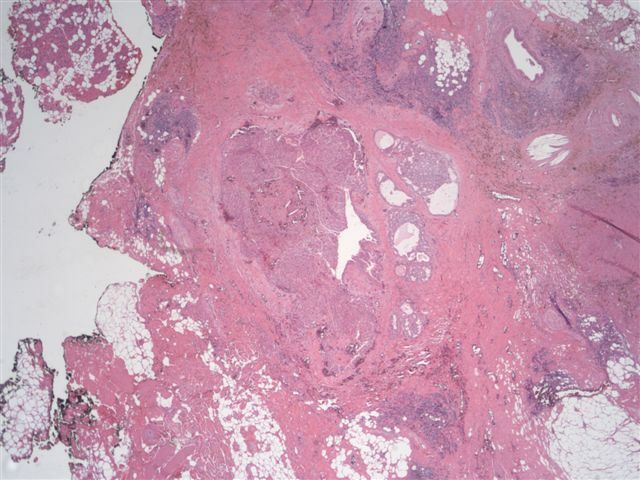 Histologically, the tumor is unencapsulated and composed of single or multiple cysts with an intraductal proliferation. The cystic cavity is lined with cytologically bland apocrine ductal cells. The intraductal proliferation has a cribriform pattern with �sieve-like spaces� similar to breast proliferations. 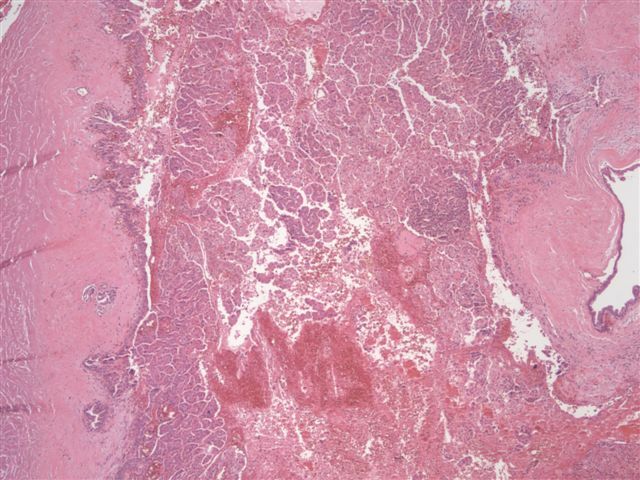 The majority of the tumor is intraductal; however, small areas of invasion may be present. 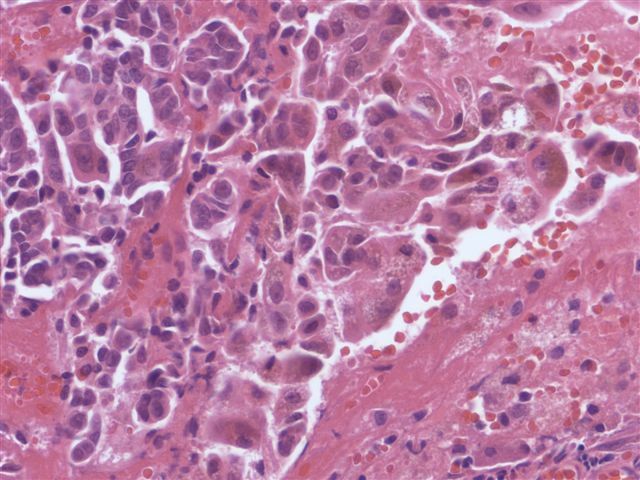 The ductal cells have PAS-positive/diastase-resistant microvacuoles and yellow-brown, lipofuscin-like pigment. There is often associated hemorrhage, cholesterol clefts and hemosiderin-laden macrophages due to cyst rupture. LGCCC demonstrates strong diffuse S100 staining. Myoepithelial markers including p63, calponin and calmodulin decorate the flat cells lining the cystic spaces. If there are areas of invasion, the myoepithelial cells are typically absent. 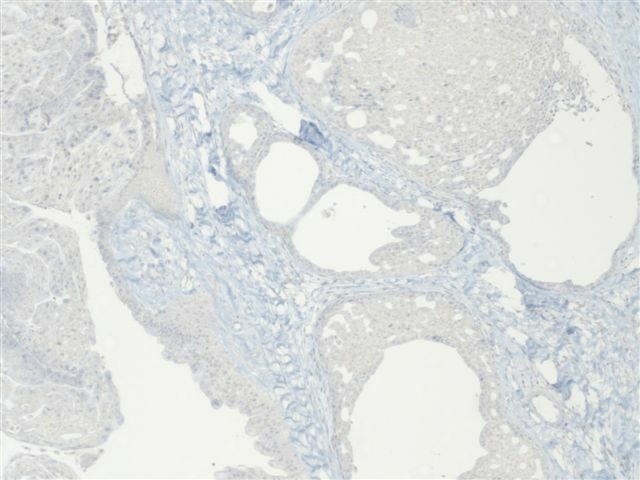 In contrast to salivary duct carcinoma, LGCCC is negative for Her2/Neu and androgen receptor staining. 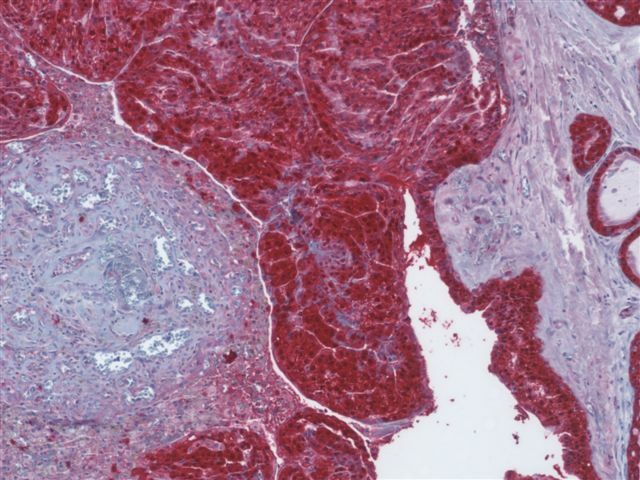 Differential diagnosis includes the papillary cystic variant of acinic cell carcinoma, which characteristically lacks the yellow-brown pigment and has finer PAS positive microvacuoles. Another differential consideration is cystadenocarcinoma, which has a more invasive growth pattern and lacks a prominent intraductal component. Low grade cribriform cystadenocarcinoma has an excellent prognosis with no reported recurrences. Brandwein M, Gnepp DR. Low-grade cribriform cystadenocarcinoma. World Health Organization Classification of Head and Neck Tumours 2005: Tumors of the Salivary Gland, page 233.